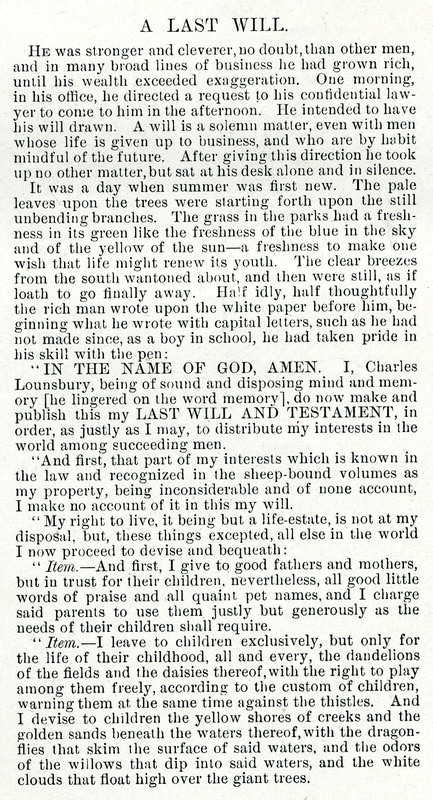 Attorney, businessman, and part-time author, Williston Fish created the sentimental "Last Will of Charles Lounsbury" in 1897. As Fish recalled later: "The name, Charles Lounsbury . . . is a name in my family of three generations ago – back in York State where the real owner of it was a big, strong, all-around good kind of a man . . . [s]o I took the name of Charles Lounsbury to add strength and goodwill to my story. "The imaginary Lounsbury was variously identified as a wealthy client of Fish, an anonymous millionaire, a Chicago attorney housed in the Cook County Asylum, a hobo, and a destitute millionaire in a Chicago jail cell. In most versions, the will was found in the pocket of a tattered overcoat after the death of the owner. 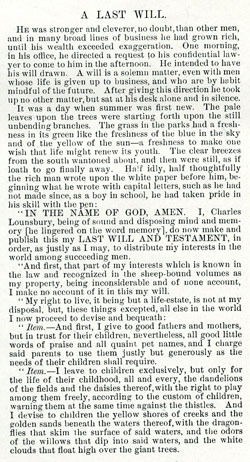 This work, also known as A Last Will, The Hobo’s Will or The Happy Testament, first appeared in Harper’s Weekly in 1898. It was reprinted so many times, often in a garbled or “improved” form, that a correct edition was published in 1908. Both the 1898 and the 1908 editions appear here. This fictional “prose-poetry” testament was often printed in the guise of an actual legal instrument, frequently without attribution, or at least accurate attribution. For generations of attorneys, it became a classic that circulated widely around the holidays as a gift-book or holiday greeting. Williston Fish (1858-1939), briefly attended Oberlin College before attending the United States Military Academy at West Point. Following six years of service in the Army, he studied for and was admitted to the Illinois Bar. 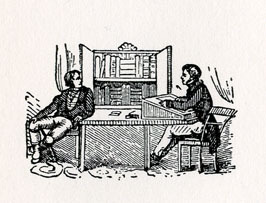 Although Fish ultimately chose a business career over law, his passion was creative writing, and over the course of his lifetime, he published at least three books and 500 articles, stories, and poems for periodicals. He lived in Chicago, where he and his wife raised three children.